Try our Dijon Oven-Roasted Vegetables as a side dish with your lunch or dinner. 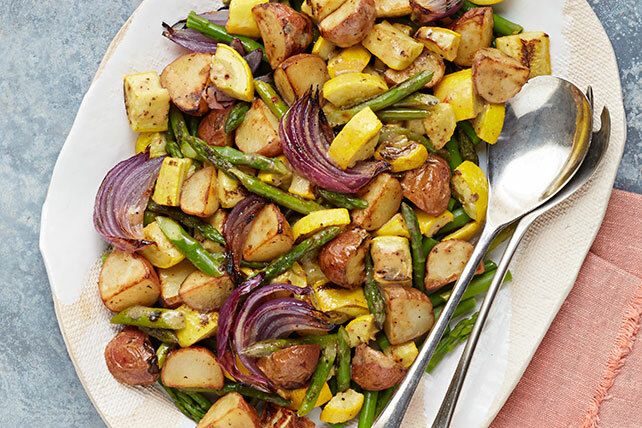 Our Dijon Oven-Roasted Vegetables recipe is a zesty and colorful dish. Mix dressing and mustard until blended. Toss potatoes with 2 Tbsp. dressing mixture in large bowl; spread onto bottom of large shallow pan sprayed with cooking spray. Bake 15 min. Meanwhile, toss asparagus, squash and onions with remaining dressing mixture. Add asparagus mixture to pan with potatoes. Bake 18 to 20 min. or until vegetables are tender. Substitute zucchini for the yellow squash, and 6 quartered radishes for the onion wedges.